I make it a point not to take personal finance cues from Adam Sandler movies, so I’ve never attempted the stunt from Big Daddy in which Sandler instructs his son to throw cans of SpaghettiOs on the ground (“dented cans are half-price”). Not only is this a shady method of saving money at the grocery store, it’s also probably unsafe; we’ve all been told not to eat food from severely dented cans. Why? “Never purchase or use cans that are bulging, rusted, leaking, or deeply dented,” Janell Goodwin, a technical information specialist with the U.S. Department Of Agriculture’s Food Safety and Inspection Service, warns me. 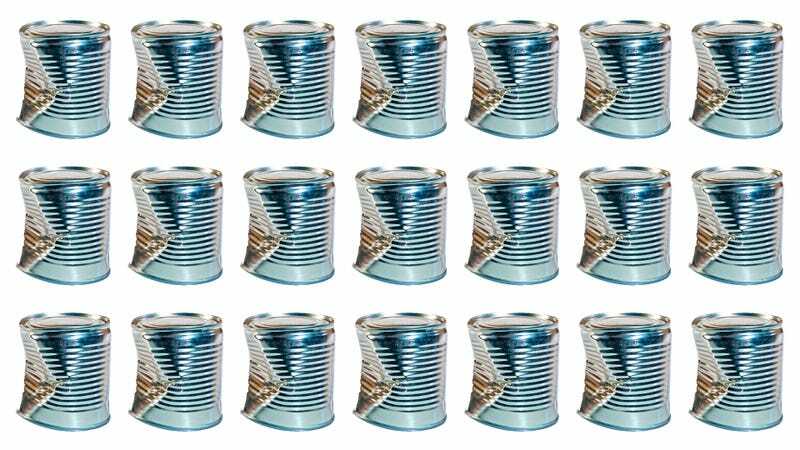 Large dents often come to a point inside the can—which we can’t see—which could cause small ruptures in the packaging that allow bacteria to enter the can and contaminate the food. Because we normally can’t see whether a deep dent has broken the can or not, we’re often advised to be on the safe side and toss all cans with deep dents, as well as cans with dents along their seams. Cans with only small dents, on the other hand, are safe. How can you determine how deep a dent is too deep? The USDA says a deeply dented can is one you can “lay your finger into.” Because those cans could cause “a food safety issue,” grocery stores remove them from shelves, says Greg Ferrara, executive vice president of the National Grocers Association. But if you’re loathe to toss out that food, you still have an option. Joe Schwarcz, director of the McGill University Office For Science And Society In Montreal, notes that you could boil the contents of the can, which would be sufficient to kill microbes or any toxin that could have been produced by Clostridium botulinum (the bacteria whose neurotoxins can cause botulism).